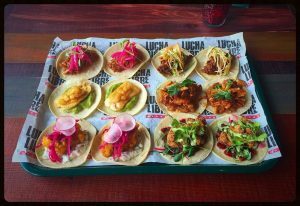 Take away the sombreros, the donkeys; anything that should never have made it beyond the airport departure lounge and what you’re left with is Lucha Libre, Liverpool’s uber cool, and most authentic Mexican cantina serving up all kinds of deliciousness. 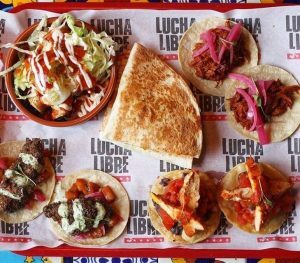 Based in Liverpool City Centre’s Ropewalks District, Lucha Libre is a far cry from the generic Mexican franchises that seem to be popping up in every town and city – cramming in as many cultural signifiers as possible with some kind of ill-conceived aim to create an authentic atmosphere. At Lucha Libre, it’s all about great food, not cheesy themes and props! 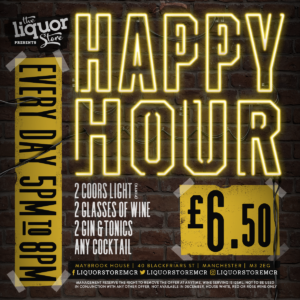 Whether it’s lunch, dinner, cocktails, beers, or most importantly – Tequila, the team at Lucha Libre have got you covered. 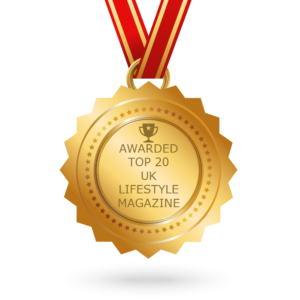 Using fresh ingredients, they have produced unique and inventive dishes you won’t find in any other restaurants, packed full with flavours and spices for all tastes – just look out for the little chilli symbols on the menu to avoid any eye-watering mishaps. 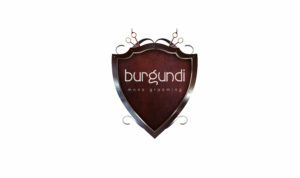 The menu has a great selection of dishes to choose from, whether you’re a diehard lover of Mexican cuisine or a newbie wanting to explore pastures new. It’s easy to navigate through the different options: tapas dishes, and the classic Mexican trio of quesadillas, tacos and burritos all feature strongly but that’s where the predictability ends because here there’s more than a few twists. We ordered the Street Food Tray (£22.50) which is more than enough for two people – it comes with 3 x Pibil Taco, 3 x Chilli Cheese Taco, 2 x Chicken Tostada, 1 x Chorizo & Potato Quesadilla & mole black beans. I’ll hold my hands up – when it comes to spicy food, I’m about as soft as a person could be (I’m the kind of person who goes to Nando’s and orders Plain-ish chicken). But, nothing that came with this tray was too spicy for me, some of the taco’s had a bit of a kick but nothing over powering, and it all tasted delicious! We were going to order some more separate tapas dishes but at the advise of our waitress we didn’t – and it’s a good job because we practically had to roll out of the restaurant at the end of the meal! 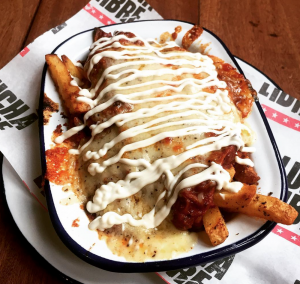 We also ordered some Dirty Fries (£4.95), a mixture of sweet potato and spicy fries smothered in sour cream, melted cheese and pork & beef! They were heaven in a bowl, in fact it’s making my mouth water just thinking about it! And, they also have veggie and vegan versions too. Ending the meal, I simply had to try the White Chocolate Cheesecake – and it was quite literally like tasting silk, it was amazing! 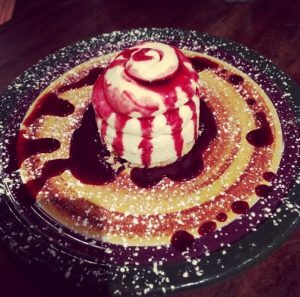 And the strawberry sauce that went along with it gave it a fab fruity touch, and although I was extremely full from the main course, I can confirm that I did finish it all, and I would most definitely order it again! My friends that I was dining with all tried different desserts, and they all seemed to go down a treat! No Mexican cuisine would really be complete without a tequila or 2, or for you cocktail lovers theirs a great selection with lots of different flavours, including the Mexican favourite Margarita’s! VIVA Verdict: Overall, the standard of food was fantastic – everybody loved sharing the taco trays, the restaurant has a very laid back, chilled vibe & the staff couldn’t of been more helpful, especially when it came to food recommendations! 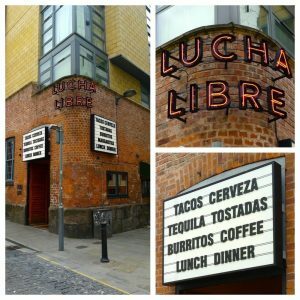 Lucha Libre gets a massive thumbs up from VIVA!